The first wicket fell on the first ball after the first drinks break. Clean bowled. 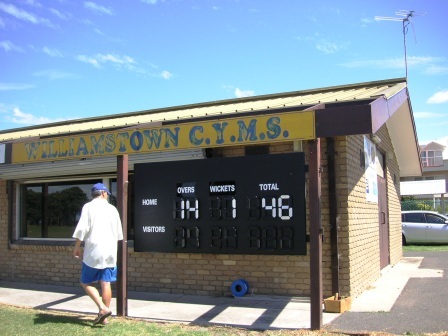 The game was a 36 overs each sem-final between home team Williamstown CYMs third XI, and Seddon. Early March this year. 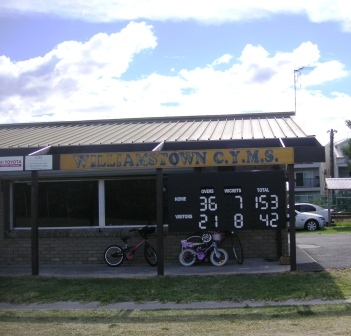 The Fearon Reservc was, more than a hundred years ago, the home ground for the Williamstown Football Club (which now plays just up the road in much grander facilities.) 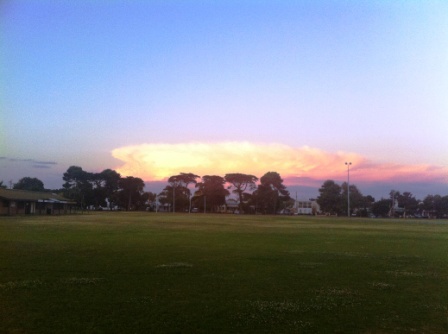 The Fearon has two ovals, beside botanical gardens and opposite the Williamstown beach. The grounds arre home to two cricket clubs, a football club, a lacrosse club, kite-flyers, dog walkers and , on Sunday mornings, a bunch of old blokes playing kick-to-kick. 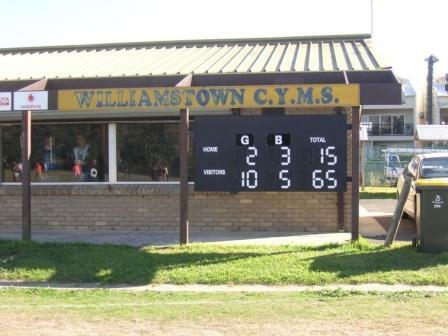 Williamstown CYMS Football Club (Catholic Young Mens Society) dates back to 1886 and has won 14 premierships in various leagues, most recently in 2008 and 2009 in the lower divisions of the Victorian Amateur Football League. 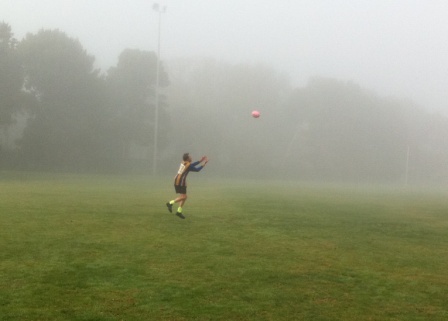 This year they are being coached by champion Williamstown full-forward Ian ‘Chops’ Rickman. 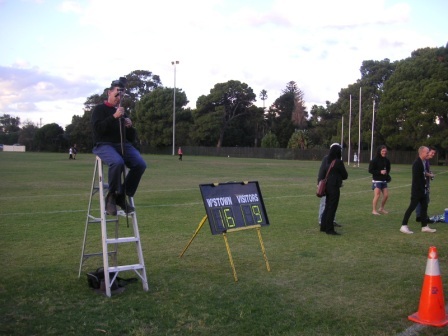 Half-time in the reserves (in 2010) and the home team’s not looking too good. They fared better in the second half but still couldn’t peg back Whitefriars, losing by nearly five goals. One of the highlights of the game was when CY’s ruckman Shagger (that’s what the coach called him at quarter-time) flew above the pack in defence in the second quarter and took a top mark in front of his mates lining the boundary. If you’re going to have a name like Shagger and a mop of dreadlock hair tied back you want to make sure you’re noticed for your skills as well. 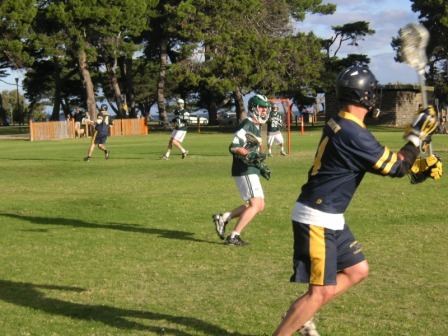 Fearon Reserve is also home to the thriving Williamstown Lacrosse Club, the home of many Australian representatives. 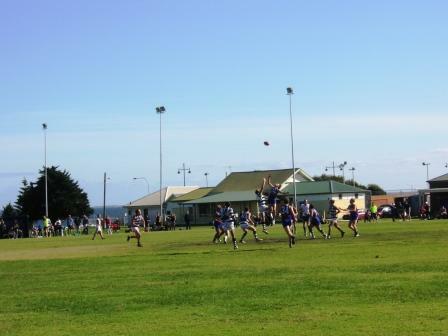 In the score above Williamstown’s senior men’s has just completed a strong win over local rivals Footscray. 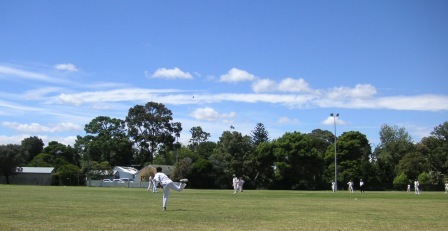 A sports ground can have different moods. The above two photos were taken by Rodger Young, a regular visitor to the Fearon, particularly for the Sunday morning kick-to-kick sessions. On Wednesday evening 2 May the Williamstown CYMS clubrooms will host ‘Write Line Fever: Sports writing and the changing media’. The night features eminent cricket writer Gideon Haigh and The Footy Almanac’s John Harms, with Scoreboard Pressure’s Vin Maskell. Tickets are $10. Drinks at bar prices. The event is part of the Williamstown Literary Festival.